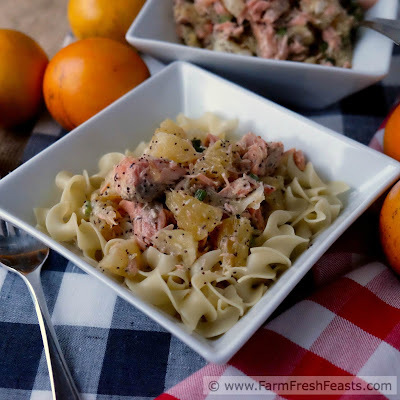 Salmon and fresh oranges in a poppy seed vinaigrette, served over hot pasta. The bright and fresh flavors of this dish lighten up the dark winter days. New photos from the 2015 Band Fruit Fundraiser! After you've had your Band Fundraiser Tangerines for breakfast in this dish, it's time to think about what to do with your Band Fundraiser Oranges! Here's a recipe round up for ya. 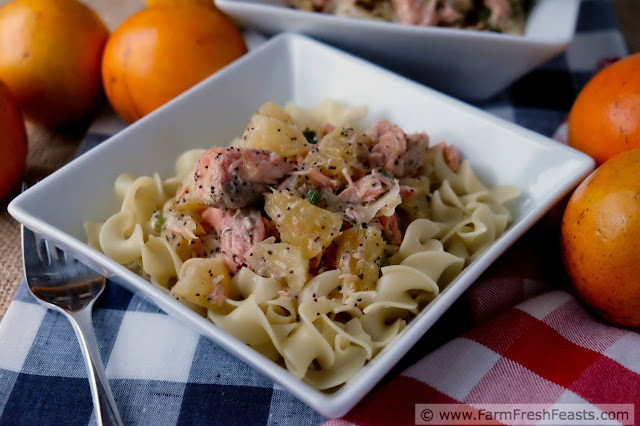 This is one of those 'so crazy it must be good' combinations--salmon, with oranges, green onions, and poppy seed in a vinaigrette. Served over noodles. Sounds weird, right? I was sick of eating fruit fundraiser oranges just out of hand, and my friend Debbie told me about her sister Chrissy's recipe from a magazine (Cooking Light maybe?). The combination sounded so weird that I had to try it. Debbie brought it over and we enjoyed it while watching Love, Actually. So in my mind, the holiday season, the fruit fundraiser season, and this recipe all roll together. 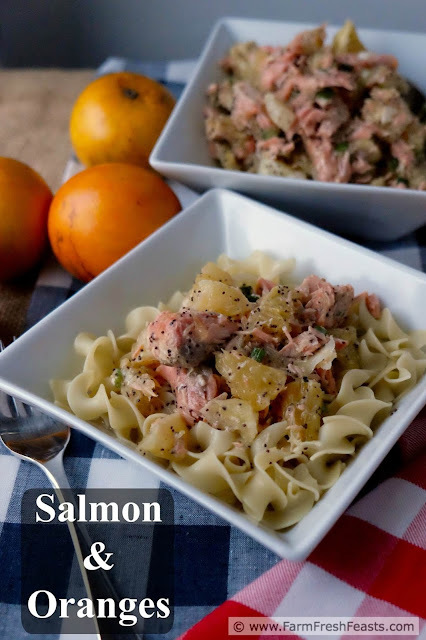 I normally make this recipe with a salmon fillet, but in the interests of trying to be more frugal, I decided to try it with canned salmon. 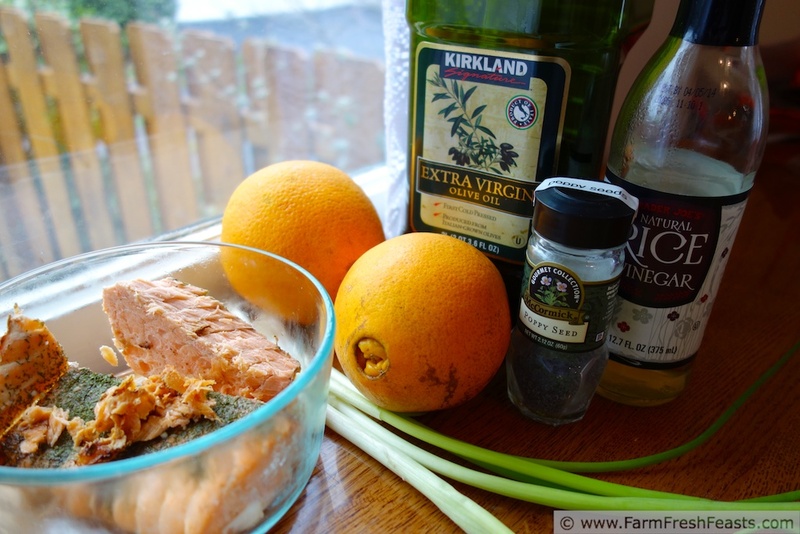 I've never used canned salmon before. If you eat blindfolded, the dish is about the same (slight textural difference). But I eat with my eyes first, so to me the dish is better with a salmon fillet. Ingredients if you're making it w/ canned salmon. Ingredients (minus OJ and garlic and pepper--sheesh!) if you're making it with a filet. Ready for baking--forgot the 'post' shot. 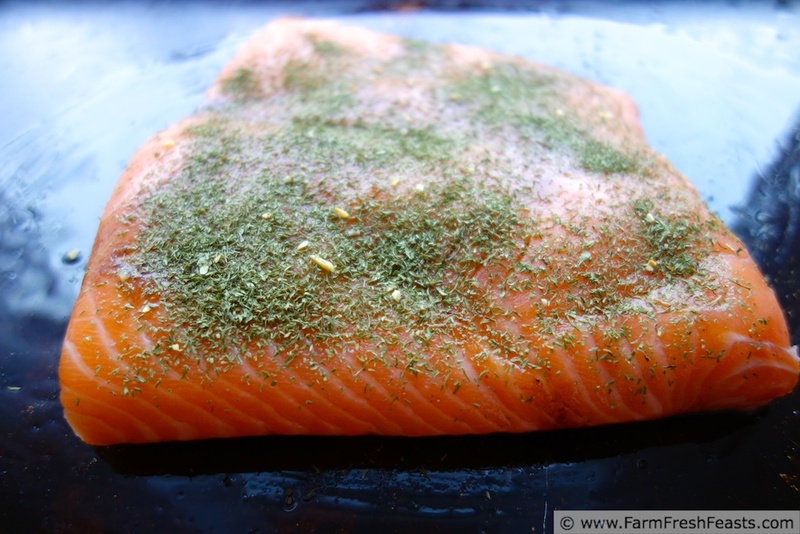 Season the salmon with the dill mix and place on an oiled baking sheet. 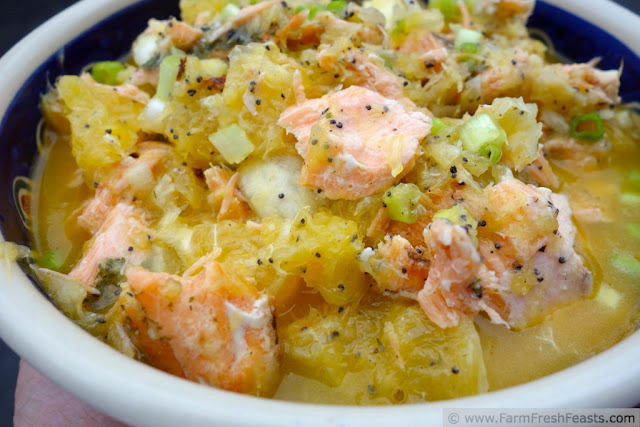 Bake for about 20-25 minutes until fish flakes easily with a fork. Set aside. 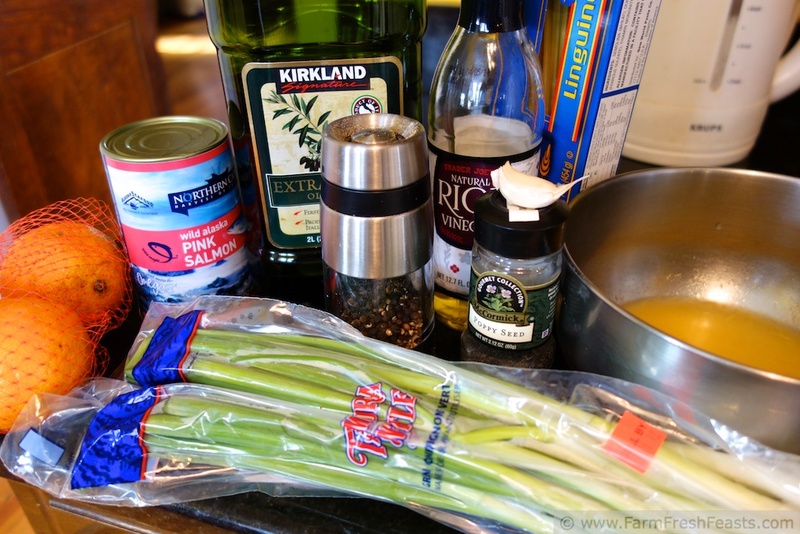 In a medium bowl, whisk together the oil, vinegar, juice, and seasonings. 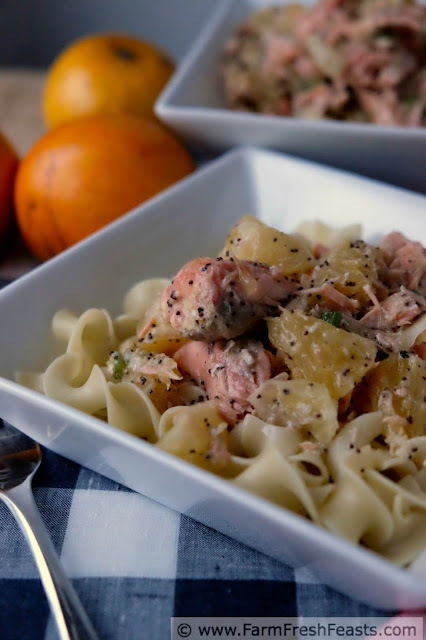 Fold in the oranges, onions and salmon, leaving the salmon in large-ish chunks. NOTE: I do not get all fancy while sectioning the oranges. Feel free to indulge if you'd like. This post is playing with the rest of the gang at What's In The Box on In Her Chucks and Strange But Good at Sprint2TheTable, and Foodie Friends Friday. For more recipes using oranges, please see my Orange Recipes Collection, part of the Visual Recipe Index by Ingredient. This index is a resource for folks like me who can't resist the lure of a bargain on fresh produce and then get stuck with perishables that need to be eaten up. For more recipes please follow me on Pinterest, on Instagram, and on my FB page. Want to know How to Use This Blog? 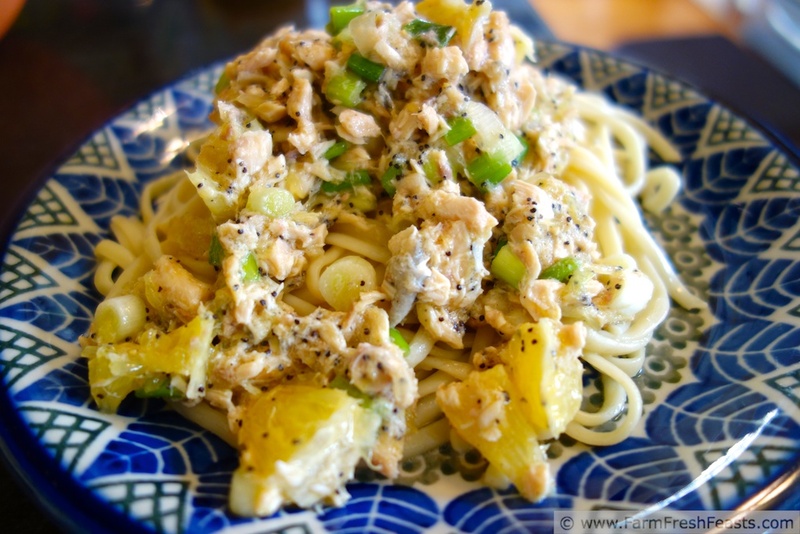 This is also delicious--and low carb--without noodles. This sounds really, really good to me. I have fish on the meal plan for tomorrow night so I may try this. I'm thinking rice vinegar and rice noodles for an Asian spin. Annemarie, that sounds delicious! Somehow I never think about rice noodles for anything other than spring rolls. Thank you for suggesting it and please let me know how it turns out! Yes it absolutely sounds weird, which is part of it's charm. You need to link this up the Laura's Strange But Good combos. Her site is http://www.sprint2thetable.com/. It's perfect!! Thanks for sending Kristen my way, Meghan! Laura, I think you are right. Fruit and salmon, leek and potato, bacon and the world . . .
Heather, you're so blessed to live near year round local goodness! Thanks for coming to our linky party at Foodie Friends Friday! I'm glad to be able to participate, and I like how the theme changes often.